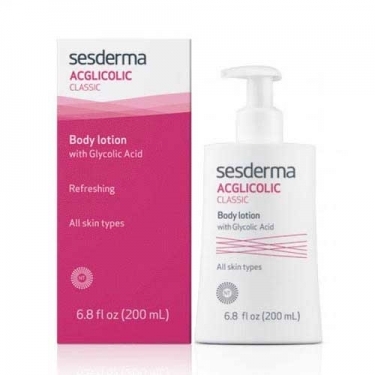 DESCRIPTION: Acglicolic Classic Body Milk Antiaging from Sesderma is an anti-aging body milk for all skin types. Formulated with Boswellic and Glycolic Acids and Milk Proteins, it offers your skin anti-aging, anti-inflammatory and anti-oxidant action while nourishing and moisturizing intensely. Non-comedogenic. Apply on the skin with a gentle massage until the absorption of the product.